While companies that fail to adapt are going out of business, others are racing to transform to remain competitive in today's digital world. In today’s world, significant external forces are buffeting every enterprise. These forces—which can all be roughly categorised into the four buckets of regulation, technology, market forces and competition—are compelling organisations everywhere to reassess their business models and operations. On the regulatory side, we are seeing lawmakers catch up with the rapid technological advances that have taken place over the last few years. This month will see the introduction of radical new legislation in the form of GDPR, which will force organisations that hold and process consumer data to be more transparent about how they process this data. Elsewhere, lawmakers around the world are progressively passing round a whole raft of legislation in areas like corporate governance, employment and the work place, finance, and health and safety. Changes are also happening in the market, where a few large technology companies like Google, Amazon, Facebook and Microsoft—and now Alibaba and Airbnb—are starting to dominate. Whether in cloud computing, online commerce, or social networking, these companies are starting to carve out entire industries for themselves. This means that, increasingly, businesses of all sizes must deal with one or many of these internet giants, no matter what sector they operate in. At the same time, these same companies must deal with intensifying competition in their own marketplaces where new entrants are better harnessing new technology like cloud computing, machine learning, blockchain, big data, and digital identity. Adding to the mix, supplier and buyer power are also increasing. In response to these raging external forces, companies are racing to digitally transform themselves, harnessing new technology to future-proof their businesses, avoid falling foul of changing regulatory environments, and compete with nimbler, more technologically-adept competitors. Data is central to this transformation. Data enables the deployment of new technologies and produces actionable insights that businesses can use to drive better decision making. For the delivery company mapping new routes, the political consultancy understanding likely voter intentions, and the bank rolling out new mobile apps, data is crucial for businesses looking to harness digital transformation. As these new technologies are increasingly deployed across the enterprise in pursuit of digital transformation, the power of data will become increasingly important. However, for businesses running a wide range of data and enterprise assets, it can be a challenge to bring these various moving parts together into a ‘single version of the truth.’ Moreover, these various assets are often siloed and distributed right across the enterprise with different owners, so that few people have complete visibility over all of them. There is often also a skills gap across the enterprise, which prevents businesses from taking full advantage of their data. 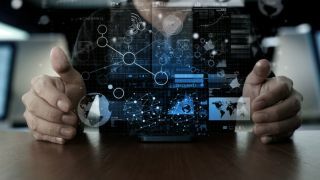 To grasp the potential of a data-driven digital transformation, businesses must deploy ‘intelligence everywhere.’ This means bringing these various assets together in a modern analytics platform that delivers powerful services and publishes trusted data. Crucially, however, data now touches every aspect of the enterprise and almost every employee. Therefore, every constituent in the enterprise who can use analytics to gain valuable insights should be given access to this data on every device they use—TV, desktop, tablet, phone, watches, wall displays, and even voice assistants. Data from everywhere across the enterprise, delivered to everyone, available wherever they are. By putting data analytics in the hands of every user and producing a single version of the truth, companies can enable digital transformation and better anticipate the challenges and opportunities of this new business environment. Executives and senior management often have access to analytics applications on one device—the desktop. They might have visibility over the various functions across the business such as sales, marketing, finance, HR, and IT. However, the data is likely to be siloed and unreliable, and there will be few applications for the data. In this scenario key employees are denied access to valuable insights, and executives who do have access only have it when at their desks or in meetings—not when or how they need it. A more mature enterprise will extend this access across the enterprise to all users, across all devices and to new analytics applications like data discovery, embedded analytics, enterprise mobility, and mobile productivity. A fully intelligent business will also roll out the most advanced analytics intelligence applications like mobile identity, mobile telemetry, and external apps beyond the enterprise to include all relevant constituents, such as customers, vendors, influencers, and VIP clientele. It will also make these analytics applications available on cutting-edge new technologies like smart watches and voice assistants. In recent years, new technology, changing market forces, and evolving geo-politics have come together to create a period of turbulence in the business world. Companies that are failing to adapt are going out of business, while others are racing to transform and compete in this new environment. Data is crucial to this transformation. However, data in the hands of a few executives at the top across outdated devices won’t cut it. Powerful analytics have to be democratised and distributed across the enterprise so that every constituent in every department has role-specific intelligence applications at their fingertips. An Intelligent Enterprise can dramatically boost efficiency and productivity, giving organizations that competitive advantage they need to thrive in today’s increasingly challenging business environment.